At my house I am constantly picking up 3 things: pennies, Legos, and broken crayons. Seriously, I have no idea where they all come from, but without fail, 5 seconds after I sweep or vacuum any surface in my house, I look down and there are pennies, Legos, and crayons. it’s like some mystical force that spews them out just to mock me. If you’ve got mystery crayons at your house too then this one is for you. I used to make these with my Mom when I was little, so strangely enough, the smell of baking wax is as nostalgic as baking cookies for me. Rummage through your big bucket of crayons and pull out all of the misfits: broken, paperless, etc. Remove all the paper wrappers. For some reason, there’s always a few wrappers that seem to be attached with super glue. (Edit: Love this tip from a reader: for hard to remove papers, place crayons in a bowl of hot water for a few minutes and they slide right off!) Divide them by color if you are like me and obsessed with organizing things by color. You might want to chop them up into small pieces. If you’re doing solid color crayons you can just place large pieces in together. If you want multicolored ones like you see in my photos below, pea sized is best. It helps to use a sharp knife and to cut on some folded paper towels to minimize the little pieces shooting off everywhere. There’s a few different ways to do these, so I’ll tell you my opinions. 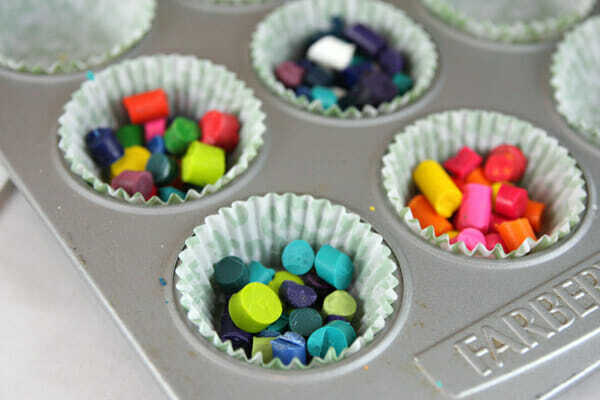 You can pop these crayon bits right into a muffin tin (I prefer a mini muffin pan; it’s a good size for little hands to hold onto). If you have a nice non-stick pan, the crayons actually pop right out cleanly-in my experience, without a paper liner or anything. Pans without a non-stick finish might leave some waxy residue, but spraying it with a little non-stick spray helps. Regardless of what kind of pan you use, you might want to use paper cupcake liners just to protect your pan if you’re worried about it. I have a few older pans I use for projects like this just so I don’t ruin my good ones in case anything happens. Using paper or foil liners gives the crayons a slightly more matte finish, whereas putting them straight in a pan usually yields a shinier crayon. 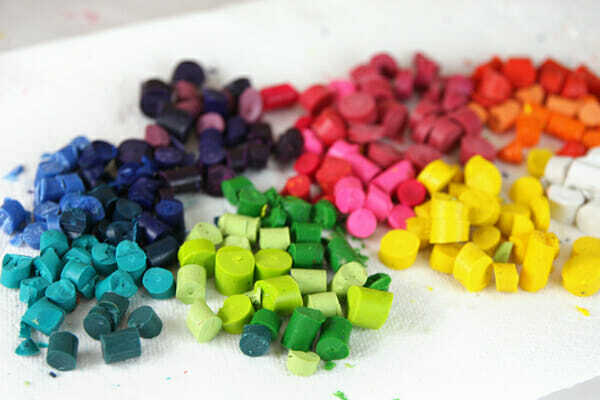 You can make solid color crayons or mix up the colors for multi-colored ones. Just nestle little piles of crayon bits into your muffin tin. Or, try silicone molds for fun shapes. Be aware that the crayons will leave a residue on silicone, so use ones you don’t mind dedicating to crafts. And make sure to place your silicone molds on top of a foil lined cookie sheet when you put them in the oven; this is important! I bought these little heart shaped ones from the Target dollar section last year and I just saw them there again the other day. $2.50 for two! Now- they’re labeled as ice cube trays, and a couple of people have commented that there’s didn’t work well in the oven, but I’ve used these several times and they’ve worked great. If you’re worried, you can always lower your oven temperature and just take longer to bake the crayons. OR, instead of baking, use the microwave method of melt-and-pour that I talk about later in this post. Like I said, I use these all the time in the oven and I’ve never had any problems. I’ve also used my heart-shaped ice trays from Ikea in the oven and they work too! After your tins are full, just place the pan in the oven. Let them bake until the top layer is mostly melted and smooth. It can take anywhere from 10-20 minutes at about 250 so just keep an eye on it. Baking time depends on how full they are, and the brand of crayons, and more. Carefully remove the pan and let the crayons cool completely, overnight is best, before removing them. Placing the pan in the fridge or freezer helps. After they’re cooled, pop them out of the molds. Cheaper brand crayons sometimes have leave a clear wax on the top layer after baking, but it’s easily scraped off. It’s always fun popping them out of the pan and seeing which ones turned out the coolest. 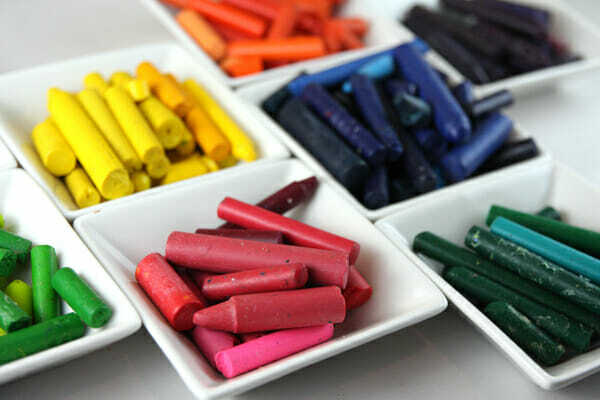 If you want well defined crayons like these ones, place the pieces in carefully and try to move the pan as little as possible after taking it out of the oven. Another method you can do is placing crayons in a double (or triple!) layer of paper cups, or glass baby food jars work great, and heating them in the microwave until melted and smooth. Some people put them in tin cans in the oven, or in a pan of simmering water, but I honestly think the microwave is the easiest. 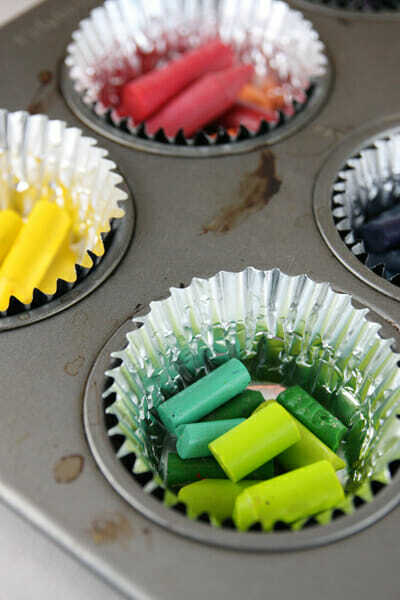 Then you can pour the wax into molds or muffin tins and after it cools and dries (speed that process up by putting the pan in the freezer) add more layers of colors for striped crayons. I was working with reeeealy thin layers, so they’re kind of messy, but you get the idea. Still fun! 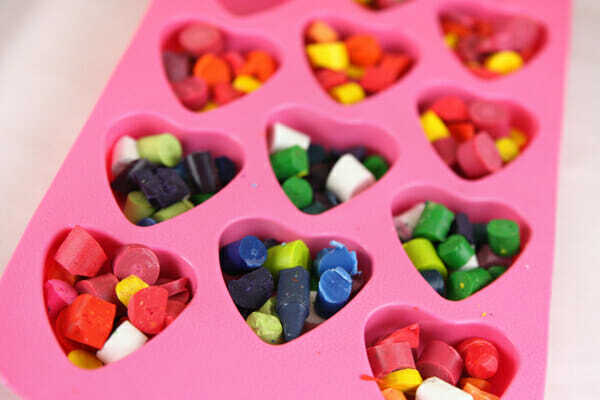 Plastic candy molds work great for this method as well and you can make them in all sorts of fun shapes. 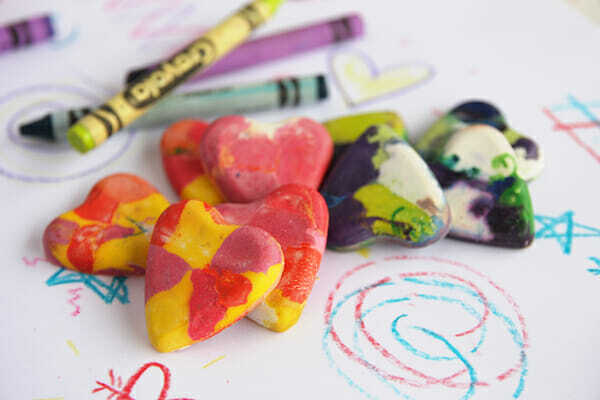 Since I had all of these cute heart-shaped crayons, I thought it would be fun to turn them into Valentines. Now, let me be clear in saying that I am generally not the kind of Mom who goes out of her way to make homemade heart shaped crayons for her kid’s Valentines. I’m the mom who got way more excited that one should when she purchased a dozen doughnuts at Krispy Kreme over the weekend and found out she got 12 free doughnut coupon Valentines. And then tried to figure out how she could sneak more so she’d have enough for the entire kindergarten class and wouldn’t have to make anything else. But let’s say you do have the time to make adorable little crayons for all your kids friends; which is really fun and a nice change from all the candy! Then you’ll definitely need adorable labels too. These are for the little 3 inch bags, but like always, you could just cut the labels out into rectangles and tie them on to any little baggie. 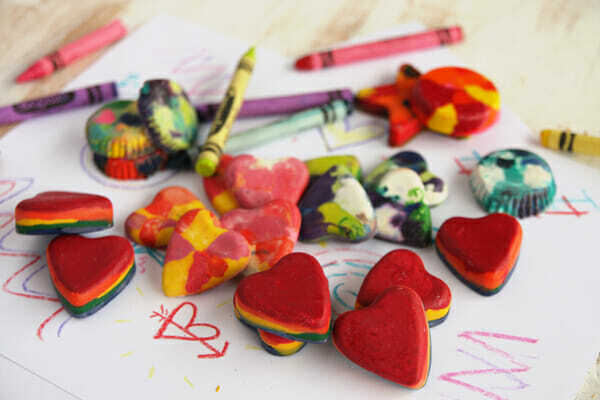 And you certainly don’t have to use heart molds for this, any shape crayon would be super cute! In fact, these would also be super duper cute with our Candy Crayons. Dipped in red, pink, and white? Too cute. Secondly, most kids are smart enough to realize they are crayons, if not by the adorable labels, then by the fact that they smell like crayola. And lastly, crayons are non-toxic; babies eat them all the time, so you’re good. Just embrace the fun! What are you waiting for? Go raid your crayon bucket! What a great idea and there so cute! Fantastic! I think a trip to Target is in order. These are so cute and when you think about all of the molds out there, it gets me excited about all of the different shaped crayons you can make. & dogs, don’t forget dogs eat crayons like they were made w/ beef fat or lard… The dollar tree usually has some fun silicon holiday themed ide trays too! Hooray! Thanks for the printable. 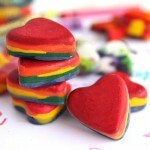 I just finished making 72 heart shaped crayons last night since my kids aren’t allowed to take candy to school. My job for today is to make a label and you have just made it WAY easier! Thanks you! I have made these before, and they are always a hit. And, I love that you have been blogging so long that you try to always cover all bases when it comes to comments that you might receive. 🙂 Happy Friday!! He’d rather take candy. But they look fun to make! I just bought some of those heart shapes trays at Target but didn’t know if I could use them in the oven since they’re labeled as ice cube trays. But I was hoping I could, so if you’ve done it, I think I’ll try it! Yep, mine worked just fine- the oven temp is so low that even if they weren’t silicone, it wouldn’t heat them enough to do anything weird. Did you out yours in a cookie sheet too? There is certainly a difference between the melted quality of the Crayola brand vs the dollar store ones. Yeah ! For this post! Oh my gosh – I was so excited to see this! My oldest and I made crayons last weekend to give her preschool friends and just this morning I ran to Michaels to get little baggies for them – – thank you so much for the printable – – it’s exactly what I wanted, but never would have taken the time to create! You’re awesome!!! These are crazy cute! I’m making your Christmas lanterns ala Valentine’s this weekend so I guess I just added to my craft list. Thanks for another do-able idea! So cute I’m going to hold on to this idea and all our broken crayons for awhile! Great directions! I was just thinking about making these and wondering about using nonstick cooking spray. Also wondered if the silicon ice cube trays could go into the oven. Thanks for answering all my questions! My favorites are the layered ones. So cute! My daughter (the one you signed the book for, not the one you met) made these and has a muffin tin dedicated to crayon-melting, just as you suggested. I am babysitting a little five-year old “friend” this morning. Maybe we should go on a broken crayon hunting spree while she’s here just to do this for an activity! Love the poem on the back! 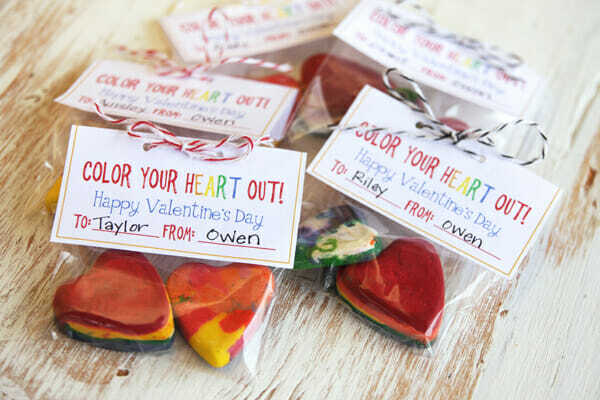 My daughter and I made heart crayons in kindergarten for her Valentine’s and one of the kids took a bite out of it before he realized it was a crayon, lol!! Love your tutorial for these crayons. I tried it the other day and had really good luck with Heart Shaped Whoopie Pie pans. Happened to see them at JoAnn Fabric and bought the tray on sale. Also, I tried the Target trays and left them in the oven too long and they melted everywhere, glad you had better luck. Love the poem and tags you made!! Did your actual trays melt?? That’s weird- mine have worked great for this! Yes- what a mess! I had last year’s version from Target so maybe they were made out of a different material. I smelled it first then realized they had dripped all over the oven. Yours are adorable. Thanks again! What a cute and creative gift idea! I love this idea. I get so tired of passing a bunch of candy out to kids what seems like every two weeks. Halloween, Christmas, Valentines, Easter….Too much candy ruins to deliciousness. I don’t remember getting this much candy when I was a kid. Am I alone? My girlfriend brought over her Crayola Crayon Maker which essentially does the exact same thing as this. This looks even cuter! I don’t ever remember getting candy, or cupcakes for birthdays, or anything like that at school when I was a kid. We did cheap paper valentines for everyone, but that was it. i love this fun idea! thanks for sharing!! I really wanted to make some crayon valentines this year but I’m running out of time! These are super cute! 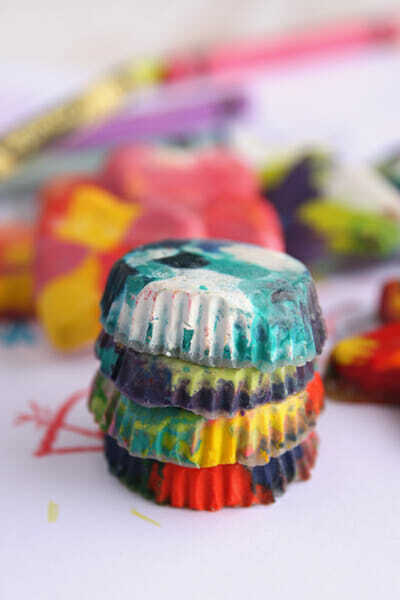 I kind of have to laugh because it seems like these muffin tin crayons are all the rage now and I actually made them all the time with my brothers and sisters when we were kids. We always did the stovetop method and actually used candy molds to get the fun shapes we wanted. This was such a fun craft that we all loved! Thanks for sharing the labels. 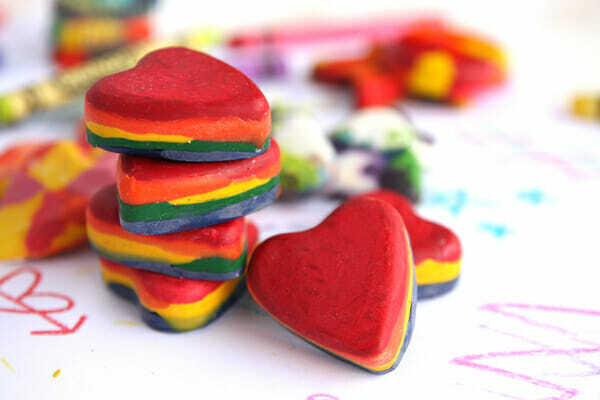 I think turning these handmade crayons into heart shaped for Valentine’s is brilliant! I love everything about this! 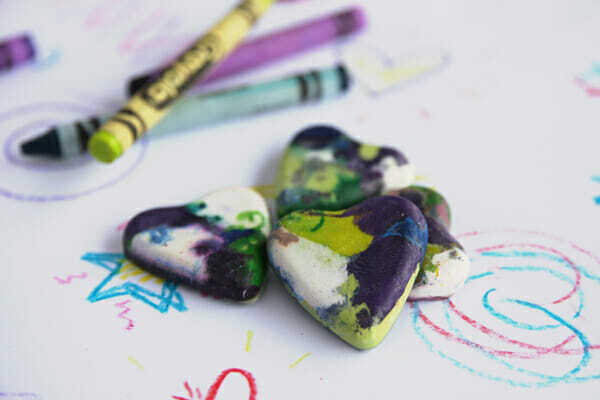 It’s a great way to recycle those bits of crayons, it’s a craft project and a cute little gift all in one. I really like the label too – nice touch. Thanks for a great tutorial! I had already been planning on doing these for my daughter’s valentines, but the molds I found were way more expensive. I make a trip to target just to check theirs out, but alas, my target didn’t carry them. 🙁 Oh well. The others will work, despite their price. In fact, they’re in the oven now. Ooh, perfect! I was just wondering what to do for my students and this is perfect 🙂 Thanks! Just made these this afternoon with my daughter! So much fun! They are awesome when you use them too! I couldn’t find the molds either, but i ended up using a Joann’s coupon and getting a square silicone mold for 4.99 and it worked wonderfully! I just popped them right out of the mold 20 minutes of baking. Didn’t even have to wait till morning! Such a cute idea, thank you! My Brownie Troop made a ton of these crayons last year using the same Target ice cube molds from the bargain area and we had no problem with them. (I’ve used them several times since and they have held up well.) Our main community service project was with Crayons for Cancer (www.crayonsforcancer.org). They are a fabulous organization that raises money for families with children undergoing cancer treatment to help pay for incidentals like parking, lunch, lodging, etc. — expenses that quickly add up but are not covered by insurance. We hosted a “crayon party” where we helped take off paper labels, sorted crayons into bins by color, and broke them into chunks. We made crayons just like you describe. We also added a sprinkle of glitter in the bottom of some molds which the girls loved. The girls were able to help design different color combinations by putting chunks into the molds– they would not have been able to participate as much if the adults had to melt and pour all the wax. (If you have not used silicone molds before, place the molds on cookie sheets to provide stability in and out of the oven.) The girls packaged the crayons in cello bags with curly ribbon. We sold all the crayons we made and donated the money to crayonsforcancer. The girls had a great time and really enjoyed helping others. You guys share the best quick craft ideas and recipes to boot! What a double whammy. 🙂 I had to include these in a Valentine’s Day post I wrote up today, I hope you don’t mind. 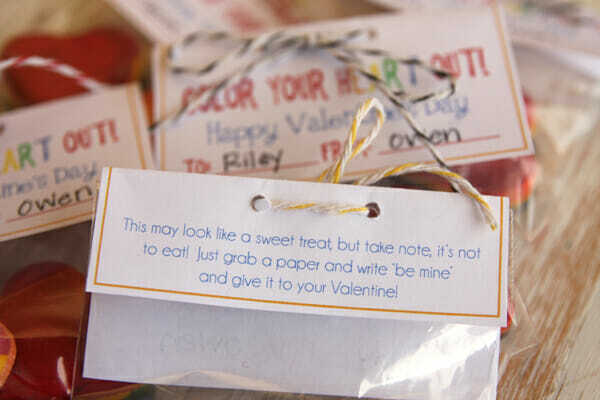 LOVE this simple and sweet V-Day idea for kids that doesn’t involve a ton of sugary valentine’s candy, haha. Thank you! What a cool idea! It almost makes we wish my kids/grandkids were young enough to enjoy this! I made these this morning and they turned out great! I used some flower shape silicone molds (couldn’t find my cute fish ones). It was a fun project to make with my daughter and we have finished assembling her Valentines. Thank you for the fun project and cute printable. We appreciate you! I might try this for one of our mother-daughter craft projects at our camps. I know we had fun today! p.s. Don’t leave them in the oven too long. One of my batches overheated and separated. 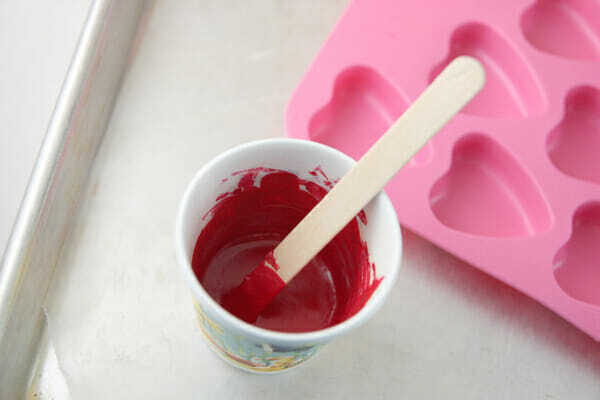 I love this idea and made them for my preschooler’s Valentines party. Just made these for my students. They are gonna LOVE’em! LOVE IT! I saw this post Friday night and my daughter and I made them the next day for her kindergarten class! The whole family pitched in searching for crayons, taking off paper and breaking them into little pieces. My daughter got a kick picking out which classmate got which heart! Thank you for sharing all your wonderful ideas!!! I was just linked to your site from Pinterest about 10 minutes ago. So far, I LOVE what I’ve seen and the way you write things is cracking me up (especially about the parents worried about the kids eating crayons). =) I look forward to searching around more and using your great ideas. Thank you! I have a couple questions that have absolutely nothing to do with crayons….I have recently come across your blog and have noticed a couple things; you frequently use kosher salt and say to use real butter. Why not regular or sea salt and margarine? Can you perhaps post this in your FAQ section? Thanks! Love the blog! And butter is simply better! We always use real butter in our recipes and margarine won’t have the same results so we recommend you use what we do. I have noticed that when I use the knock off version of crayons they don’t turn out so well. Crayola works the best. I was planning to do this for my daughter’s classmates long before you posted this. I had the idea to do pirate themed crayons for a birthday party last summer and figured it would be great for Valentine’s Day. But… Thanks for the cute poem. I did borrow that for the back. It was perfect and I didn’t ever think to include a disclaimer. Funny enough – my dad made some comment about hoping some kid didn’t try to eat it. My mom said, that’s why that poem is on the back. LOL. Also, love the layered ones. I might try that with some other crayons for my girls! Thanks for sharing your ideas!!! Would it work to use cookie cutters to cut out heart shapes after the fact? Or do you think they will just be too hard? Just wanted to share a great idea with you – save old glue stick containers (with lid) and pour the melted crayon in. Let harden and voila, instant multicolored twistable crayons!! I saw these before Valentines day and thought they were really cute. Then my son’s teacher made them for his class (2nd grade) and gave them to them for Valentines. Way cute. I want to make some in Easter shapes for my kids and neices and nephews for Easter. If I can find some molds. Love your site. I find great stuff every time log on. Why are my crayons not coloring? 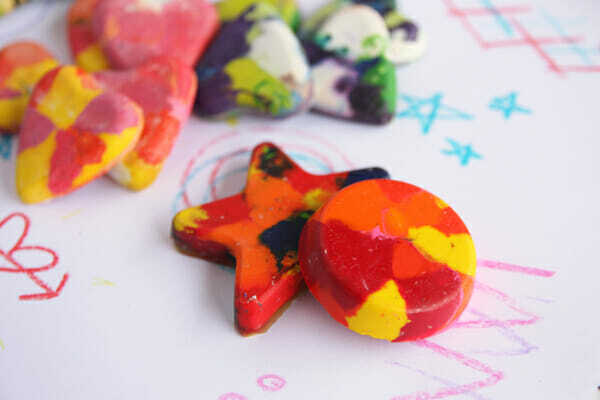 We are making these crayons with silicone molds right now. Lemon and Lime molds and Titanic and iceberg molds, to be exact. The kiddos are having a ball! And I am too because your blog makes me smile. Why? Because of phrases like this: “. . .obnoxious (oops, did I just write that out loud?) concerned parents. . .” LOL! I <3 your writing style. Both of you! I was looking at the silicone ice molds at IKEA and wondered if they could be used in the oven. Thanks for this encouraging post noe I will try using them. 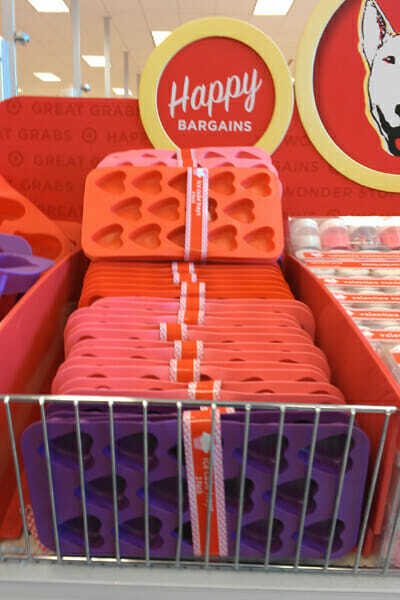 These cute heart shaped Molds? Find any. I need them ASAP within 6weeks . So awesome! I found this on pinterest and am so glad i did! I love the poem! Thanks so much! I picked up the heart shaped molds at Target last week and tried making the crayons, now they won’t pop out! I even used non stick spray on half of them but it didn’t work. I guess it’s muffin cups and marble time! LOVE this idea and your adorable tags!!! My daughter and I made them for her kindergarten class and I made them for my own kindergarten students as well. THANKS!!!! love it. just made them and printed the tags then realized it was amaerican spelling for colour. oh well i’m sure the JK kids wont notice. Thank you, what a great idea. I’m a kindergarten aide and my son made the crayons. We bagged them with a note pad and m&M’s. Nice post. very creative idea.Thanks for sharing. I made some of these this afternoon. I wanted something a little more toddler friendly than the ordinary crayon shapes and this fit the bill perfectly. I ended up with a thick layer of clear wax on top of each crayon though and I was wondering if you had any suggestions for why so I can avoid it next time. I used crayola crayons (she’s my first kiddo so I don’t have a properly supply of old crayons yet) but they were in the oven for quite a while. I didn’t have anywhere that felt very safe to put a bunch of hot wax so I left them in the oven after I turned it off. If I want to print the labels at Costco is it possible since it’s a PDF file ? your melted crayon instructions are perfect; very well written. Thank you for sharing! I had already made crayons (very similarly to your instructions, which would work great!) – but anyhow, I was looking for a printable, and yours is perfect! Simple, colorful, cute! I just stapled the label to the bag, and it’s absolutely adorable. Thank you! !